We chased a tornado-warned cell in north eastern Texas but it didn't produce and was rapidly outflow dominant. Still made for some nice photos. Doppler on wheels...(DOW). (For those not aware, this is a mobile weather radar used for research purposes). The tornado-warned storm north east of Dallas on our radar. This isn't the tornado warned storm (the photos of it are crap). This is another storm which moved up behind it. 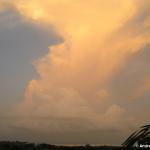 The following 5 photos are a sequence (kinda) as the outflow moved over us.